Some nice feedback from happy clients! I have safely received my sundial and just wanted to say thank you ever so much for all the work and care you've put into designing and creating it. The finished piece is exactly what I wanted, down to the pretty dragonfly, and I couldn't be more proud if I'd made it myself! I know my parents will be thrilled to receive it on their anniversary in a couple of weeks. It's been a real pleasure to deal with you, from your marvellous website (without which I couldn't have found the perfect quote) to the photo you sent me of the finished sundial (a kind thought) and the helpful instructions for setting it up. Thank you, Keith, for your efficient and friendly service, and for creating something that my mum and dad will treasure for years to come and which shows how much they mean to me. I wish you all the best and hope to be able to put some more commissions your way in the future. I would like to say a huge thank you for the wonderful sundial received today. It is truly a stunning piece of craftsmanship, and I am very grateful to you for going 'above and beyond' in delivering the sundial in time for my brothers retiral. We are so looking forward to giving him this special gift. Your service cannot be faulted, professional with a personal touch, I could not have asked for more. I just want to let you know how thrilled my husband was with the sundial. He opened it this morning, and his reaction was overwhelming. I wish you could have seen it - it brought tears to his eyes "what a special present - the best present I have ever received". And he remarked on how beautifully made it is. Thank you so much. I am so glad I did it. And by the way - he would not have liked the patination he said - he just loves it as it is. I'll send you a pic when he has put it in place. Just a note to say thank you so much for the sundial which arrived safely yesterday. It's beautiful. Thanks again for everything. Thank you for your efficient service and the beautifully crafted instrument you sent us. My wife is very pleased. Yes I received it yesterday. As promised it arrived before Christmas which is great. It's a lovely piece of which I'm sure my son will be most pleased with. We will have to find a good spot in the garden for it. Well packed with good instructions on how to to set up. It's been a pleasure to do business with you. Hope you have a good Christmas and a great New Year. Just to let you know that my sundial arrived safely this morning, I was so excited when the doorbell rang that the postman definitely gave me a funny look he must have thought I'd had an early glass of Christmas tipple!!!! It is absolutely stunning and I can't stop looking at it, I know my friend is going to be delighted when he sees it and I am sure he will choose a suitable plinth and a perfect place in his garden for it's new home. I noticed you had added an extra little butterfly on the dial which I am delighted with thank you very much, it is all so exquisite and you deserve to be very proud of your talent it is a beautiful work of art as well as a working time piece. Thank you again for all that you have done for me and for sending the dial out to me in such good time, I wish you and your family a wonderful Christmas and a very, very happy New Year. First & hope you had a merry merry Christmas! And you have a happy new year. I opened the dial on Christmas morning. It is beautiful, already getting patina from the rain & snow haha. Today was the first day that is, well was totally sunny, (expecting a big storm in the next day or two). It is spot on in time!!! MAYBE a minute off but I need to check solar noon again on the next sunny day. Funny, my girlfriend asks if it reads the right time. I tell her well no but... "I spent all that money and it doesn't keep the right time?" I try to explain matters but no comprendo, LOL. Here is a picture of it on my deck, not the final resting place but I can read it in the winter. In the spring I'll get a proper base for it and put it in MarkPark. I think I sent you a picture of MP. I snapped the picture right at clock noon. It is supposed to be 2:43 slow today & as you can see it's spot on. Thank you so much for the beautiful, functional work of art. He loves it!!! Thank you so much. Will pass on your name to everyone asking where I got it! Thank you for the sundial just received. It is even more beautiful than I had expected and exactly what I wanted. Many thanks for all you have done. You have a great web page and without that and the help of one of my sons, I'm not sure what I would have ever found a sundial on the open market that I would have been proud to give as a gift. The sundial did arrive safely on Saturday morning. Thank you, it's perfect. I'm very pleased with, as I'm sure my sister and brother-in-law will be when I present it to them on their anniversary. It's the perfect unique gift for their 25th anniversary and something that they can keep and use for many years. Thanks for your hard work and skill in producing the sundial and for your excellent service. With kindest regards and many thanks. Alison Warnes. I am thrilled --- an instant classic! So glad you prevailed on the patination as it does define the engraving handsomely. When it is in place, I will send along a photo. And I want you to know how appreciative of the accelerated production and delivery we are. I visualized you as pressed by the demands of your craft and and can assure you that the recipient, John Laird, is a man who works tremendously hard for things of lasting value --- his family, friends, and farm. We are happy to be able to give him a gift to remember. As it's a beautifully sunny day in North Wales, I thought I would snap a quick photo! The sundial has a plinth in the formal garden by the house but it looks so lovely with the house behind, I thought I would take a picture "as is". Thank you again - it's lovely!!!! My father's sundial arrived early Thursday morning as promised. He is absolutely thrilled with it. Thanks so much for all your advice, patience and skilled crafting. Looking forward to seeing it in situ in August. The sundial has arrived and it is a work of art - so beautiful and absolutely perfect. Thank you so much. I received the sundial last week. It's beautiful. Just what I asked for. I had asked my mother about a week before Mother's Day if there was something that she really wanted and asked her to think about it and let me know. A few days later she told me that she had always wanted a sundial. When she was a young girl [in the 1930's]a neighbor of hers had one in their yard and she would often go there and learned how to read it. Well, her memory isn't so good anymore but she still seems to have a good recall of her youth. So began the search. She wanted one that looked like the one from her childhood. 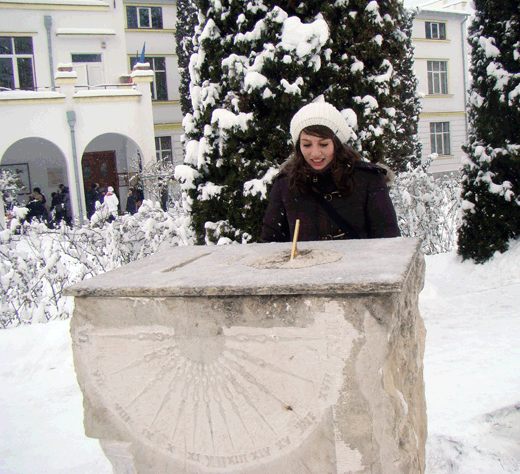 I researched and learned about sundials and could not find anything like what she wanted. Then I found The Sundial Fair and when I got to your website I had hope! I printed a picture of one of your designs and showed it to her and she said"That's like the one from my childhood." Well, it now sits proudly on it's plinth in her pretty garden and she's thrilled with it. Keith, I can't thank you enough. You're truly an artisan. You made an old woman very happy and also her daughter. I will be very happy to provide an excellent reference for you if you should ever want one. Just to let you know that our sundial arrived safely . It is so beautifully crafted and my husband is delighted with his birthday gift. I'm sure it will bring pleasure to both of us for many years to come. Here it is, in situ. It's beautiful. Thank you so very much. I'm delighted. The sundial arrived and it is beautiful, just beautiful. Thank you so much. How does it feel to be the maker of beautiful things that will last for generations? 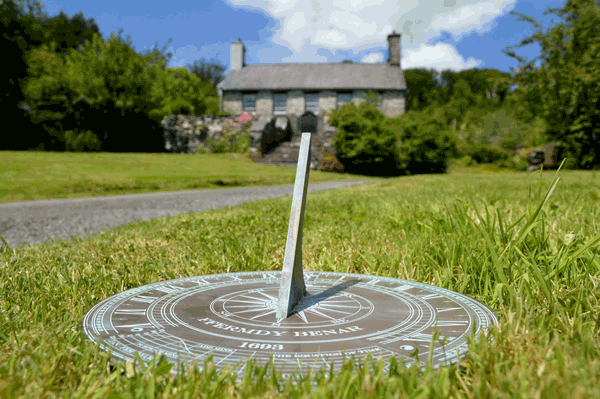 Thank you so much for the stunning sundial which you kindly designed and tailored for us. The quality and craftsmanship are exquisite, and the recipient was delighted with this unique gift, which marked a special occasion. The only problem? We want one now too! Thank you. I wanted to let you know that the sundial you sent to New Zealand for my daughter's wedding was really well received and appreciated. My new son-in-law is a tool maker so could really understand the work and design involved. I just wanted to thank you for the work of art you did for my daughter in law which she brought out here for my wife's and my birthday. It gets perfect sun cover. As you will notice I have designed my own plinth. It does the job beautifully. Wow, it's perfect! Thanks so much for getting this done on time. We're all really excited about giving this to them on Sunday! Hi Keith, the sundial arrived today safe and sound. Thank you so much for a stellar job... It really is as stupendous as I thought it was going to be. I am beyond pleased. The landscape folks are now putting in flagstone on the new patio/garden area where the sundial on a plinth will have a permanent home and as soon as the plinth arrives, providing the weather is not too harsh, I will proceed with the installation... Once in and photographable I will send some samples of it in the site... Likely the spring with plantings in place will yield the best images but I will keep you posted then too. I hope your Holidays are Blessed... Thank you so much for your amazing work! 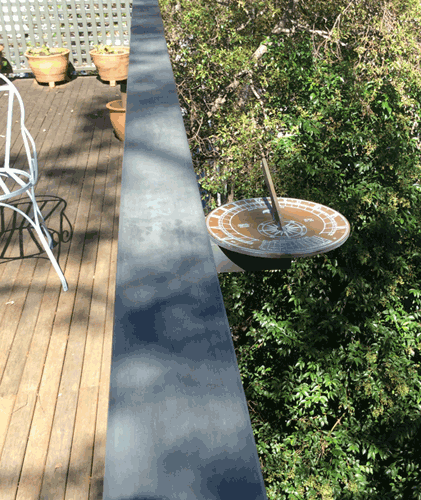 Got the sundial earlier on today…. its absolutely perfect, can't thank you enough for arranging this for me, and for the extra thickness plate too, fantastic workmanship and such a nice guy to deal with. It will take pride of place in my garden and I am so proud to own such a well crafted and individual piece of art that in itself is part of history. Thanks again for everything you have done for me, it is really appreciated and will be treasured. Take Care and good luck in your new premises. The sundial arrived safely. My wife and I are delighted with the result. It is just what we wanted. If the sun ever shines I will be able to fix it in its permanent position! We have been very impressed with the service you provide. Excellent website and prompt and informative communication. We would certainly recommend you to anyone interested in sundial enquiries. Congratulations on a first class job. The short delay is insignificant when set against the pleasure gained from the wonderful outcome. I have received the sundial today in perfect condition. It's beautiful, thank you very much. I've just realised I've completely neglected to email you to say how much I love the sundial! I'm so sorry – I've just been frantically busy and away from my computer. But the sundial arrived safely on Friday and it's exactly what I wanted. Thank you so much for all your patience in the whole process, and for making such a beautiful present for me to give my brother. Everyone who's seen it has admired it hugely. I had a leaving party on Sunday, and it looked wonderful in the glorious sunshine, and lots of people saw the sun shine through at noon. I was also really impressed with all the detailed information and supporting info about the timing of the noon flash and so forth to go with it. Assuming they agree, we are also planning to take it to the wedding reception venue and set it up there so everyone can admire it. I will take its picture soon and send it to you – but the part of the garden it's in at the moment is in the shade. It looks just fantastic on the plinth, as Dad said "As if it was made for it. Which of course it was!". I'll let you know how they like it! I have received the dial thank you, it is beautiful. Very pleased and the quick turnaround is so much appreciated. Thank you for your email - we have been away and got back to find that the sundial had been delivered! It looks fantastic - thank you. I am sure that Dad will be delighted with it when he sees it in the 'flesh'. Now I just need to get him to decide on a plinth for it! Thank you for the photo of it too. Thank you very much for our sundial. As you can see from the attached photos, it looks excellent at the gable end of the new extension to our house and the time was spot on this morning. Feel free to use the photos in your website gallery or wherever. That is fantastic - thank you ! Sorry didnt reply sooner have been away for a few days with no Internet connection. The sun dial looks amazing. My parents will be really pleased. Thanks again for managing to put it together at such a short notice. It's much appreciated. I thought you might like to see the lovely sundial you made us finally installed in our garden. Your instructions for setting it up were excellent and easy to follow. We managed to get it precisely level despite the sloping ground and I'm quite amazed at how accurate it is! I just wish moving the very heavy staddle stone around had been as easy! Flat topped stones are a traditional feature here on the Isle of Wight and we found this one at a local farm sale. The sundial is perfect for our quiet rural garden and I'm sure it will become a unique family heirloom. 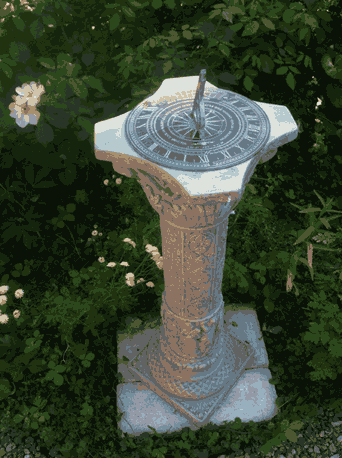 I have attached a photo of the sundial you made for me in a new garden I created this spring. It's my "gravel bar" garden, complete with a boulder fountain. We siliconed the sundial onto a small gravel boulder (forefront). I don't know if that will be its permanent home. If/when I find something I like better I will move it to something else. I decided to go with a granite boulder and as of this spring, that was the best fit I could find. When the roses grow up they will create a hedge / backdrop for the garden. I LOVE the sundial in my new garden. Thank you so much for making it for me! Keith, thank you, the sundial arrived today and looks absolutely excellent. I just hope we have enough brains to set it up properly. You have given us lots of information and explanations, so surely we should manage it. Tomorrow morning we shall embark on the great installation. The gnomon is attached, so we are all ready to go. Now for the first time I understand the meaning of Greenwich Mean Time! We are really pleased. Thank you again. This is just to confirm that we have, today, received our Sun Dial, as promised by you...............safe and sound, very well-packed, and looking very nice! We are very happy with it, thank you. Now, I have to work-out how to place it in the right position on the pedestal that we have. The instructions that you included in the package will come-in very handy, thanks. Also, I have to wait for a nice, dry, sunny day!...........the rain is pouring-down, virtually all day, here in Swanage...........in July!! It was pleasant doing business with you. 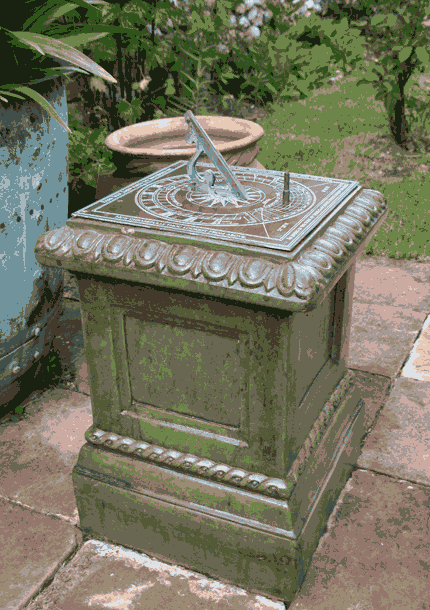 My sundial arrived - it is absolutely stunning, it really is beautiful, a true sundial. Thank you so much. It is truly beautiful. I have been onto your website to see if there is anywhere we can leave some feedback or testimonial but could not find the appropriate place. Is there a link I might have missed or alternatively please feel free to use my email to encourage other customers to view your workmanship and purchase such extraordinary gifts through your website. The sundial looks awesome in the photo Keith. I'm soo excited about receiving the real item in the post... and can't wait to give it as the Birthday present... I'm sure the recipient will be amazed too. Thank you so much for all your hard, and talented work, its much appreciated here in Lathom. I'm delighted to confirm that we received the dial in the post this morning, which was a lovely surprise! It is absolutely perfect – Julia will be delighted with it. What a lovely job you have done of it! Thank you so much for getting this to us so quickly. It is much appreciated. Sundial arrived today. Beautifully packed and so safe and sound and beautiful. We are both very pleased with it. It's to mark our golden wedding, which is a few weeks yet and so I have time to set it up and for the sun to start shining. 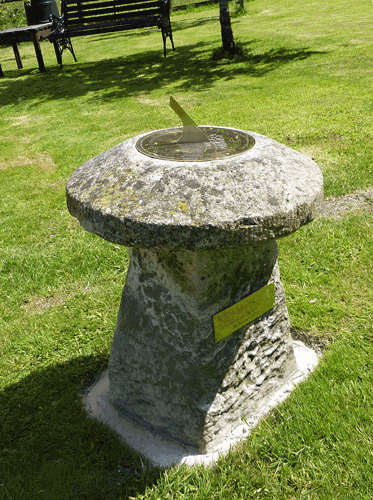 We have some interesting sundials in the village, including an angled cross from the 16th century. I'll write again when we get it on the wall and have a few people round to have a look at it. My sundial is sitting level in all directions and pointing N to a line I took on Polaris one recent clear night. I shall check it by your method as soon as I have a shadow to work with. I am most grateful to you for creating a beautiful and functional work of art that will serve as a perfect memorial to my parents, and give pleasure to all who see it. Thank you so much. Thank you, the sundial has arrived safely and I am ABSOLUTELY DELIGHTED with it!! Thank you so much again for getting it to me in time for Christmas, much appreciated. I will definitely come back to you again for any special birthdays/anniversaries in the future. Hope you have an enjoyable Christmas. Received it today thanks. Bloody gorgeous. I hope my husband likes it as much as I do. Thank you so very very much. Im glad we re did it, it looks great. Thank you Keith it has arrived and we are all very pleased with the finished product and hope very much that my Auntie and Uncle love it as much as we do. I will be recommending you to everyone who is looking for a fabulous idea for a long lasting gift. The dial has arrived and it is beautiful - thank you. My husband is delighted with his present and very interested in all the technicalities ! Once our garden has finished being landscaped (he is doing it himself) then the dial will be suitably placed. The sundial is already here. It is a beauty. I hope everybody (from our university and from city hall) will be pleased. Now we have to fix it , but only next week. I will take photos and send to you. Of course if I'll have some questions I'll ask. I just wanted to say both that it arrived safely and also a huge thank you. It is beautiful - so much more impressive than the effect from the scan you sent. A big thank you again, and I am happy to put any positive feedback on your web site if you would like? just a quick email to say thanks for the lovely sundail. She was very pleased with it. The big job they have now is getting the sun. I just wanted to say thank you for the beautiful sundial my son was very pleased and surprised. Thank you again for creating such a lovely gift. The sundial is beautiful! Thank you so much for your fine craftsmanship. I love it! I ordered a rock pedestal last weekend. I will send you a photo when we have everything set up. Thank you so much. This is just beautiful and I will always treasure it. Hi Keith, I've just unpacked the sundial and am delighted with it. Can't wait to climb up the wall and attach it. Have checked the time / shadow cast and it's spot on with your time equation chart. Am looking forward to seeing how long it takes my wife to notice it on the wall! I would just like to say on behalf of me and my entire family thank you so much. Your great service and effort made buying from you a pleasure. The sundial arrived and is truly amazing. You are a true artist. My mom loves it and the family were truly impressed. I just wanted to say a massive 'thank you'. The sundial arrived in good time as promised. It looks fantastic and me and my sister are really pleased with it. Mum and Dad love it! I will be recomending you to all my friends, a lovely, different idea for a special present. Hello Keith. I just wanted to than you again for the wonderful sundial you have made for us. It is amazingly accurate. The accompanying chart you sent depicting the Equation Of Time was easy to read and a great aid in setting up the dial to be virtually "spot-on." I have mounted it in a simple frame and it now hangs near the door to the backyard where it is available for easy reference throughout the year. All the best to you and your business.